Edited transcript from August 2015, Vein Magazine round table discussion on the ethics of treating venous patients. Expertly moderated by: Thomas O’Donnell, MD, Benjamin Andrews Professor of Surgery (Emeritus), Tufts University School of Medicine and Senior Surgeon at Tufts Medical Center. Participants: Mitchel Goldman, MD, Medical Director, Cosmetic Laser Dermatology and Volunteer Clinical Professor of Dermatology, University of California, San Diego; Jennifer Heller, MD of Johns Hopkins Medical Center in Baltimore; Jose Almeida, MD, director of the Miami Vein Center and Voluntary Professor of Surgery, University of Miami; Mark Isaacs, MD, of Vein Specialists of Northern California and John Muir Medical Center and Steve Elias, MD, director of Englewood Hospital’s Center for Vein Disease in Englewood, New Jersey. Introduction: All of us have dealt with ethical questions in the management of venous disease in various ways—either at meetings, conferences, or within our own practices. There are patients who have been treated, or rather mistreated or inappropriately treated for some type of ‘venous problem’ that may or may not be a venous problem. We are seeing more and more of this as the specialty of treating veins has exploded into other areas of sub-specialties. For this reason, VEIN Magazine brought together several physicians, from different backgrounds and disciplines of medicine—all of whom are considered leaders in the treatment of venous disease—to discuss what physicians can do to minimize borderline ethical and unethical practices from occurring in the future. Thank you to everyone who participated. Tom O’Donnell: We do not receive formal ethical training in medical school, nor in residency, but it’s clearly a major problem. I think if we look at what defines ethics it consists of a philosophy dealing with values pertaining to human conduct. There are systematic rules and principles that govern correct conduct. 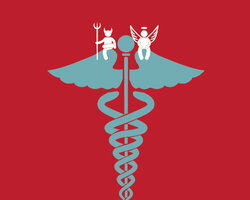 All of us physicians, when we received our white coats and took the Hippocratic Oath, stated several essential principles: to do good and to avoid evil. I particularly like this one: To leave surgery to surgeons, not to harm, not to seduce patients and not to name any confidentiality and to never gossip. That’s the introduction. Steve and I have some questions and we put together some case studies to stimulate discussions. Case one: A well-respected vascular surgeon, Dr. Cusp, who concentrates on venous disease, sees numerous patients for second opinions about whether they should undergo an ablation. The patients tend to come in for a second opinion from a cluster of two or three self-proclaimed vein specialists. Dr. Cusp does another ultrasound that unfortunately is all too familiar. Most of these patients demonstrated no reflux in the great or small saphenous veins, and Cusp advises no intervention is required. In addition, these and other patients were told they should undergo three to four separate sequential ablations in each leg. What would you do in this situation? Jennifer Heller: Well, unfortunately, I have seen this scenario too many times to count. We all have a typical demographic that we target, and so I tend to see the same practitioners doing the same pattern over and over again. Tom: Why are they doing it? Jennifer: A myriad of reasons. I see that they tell patients that it needs to be done. They exaggerate the clinical severity of their disease and then the patients, interestingly enough, sense something and then they seek a second opinion. Tom: What’s the real motivation for these physicians? Jennifer: I feel it’s financially driven, but in addition to financial motives, I think also it’s a lack of knowledge. The differential diagnosis list for leg pain is extensive. And just because a patient may have varicosities, they are more frequently not the etiology for the patient's symptom complex. Further, the same holds true for diagnostic testing: not every vein that demonstrates reflux on duplex requires an intervention. When a patient comes to my office for a second opinion, unfortunately, more often than not, my clinical assessment and treatment plan tends to be more conservative. Explaining this to the patient is a tricky situation. Most of the time, I will explain venous disease in layman’s terms to the patient, and how their findings help me make my decision. I rarely communicate with the patient's initial venous specialist. More often, I contact the patient's primary care practitioner and internist and I explain my finings and assessment to them. Tom: You are assuming that there has been a primary care doctor referring the patient. In many instances, the patients seek out vein treatment directly through print or television ads. They come direct without going through referring primary care physicians. Thus, they don’t get the so-called second opinion from the primary care doctor. What would you recommend, Jose? Jose Almeida: I pretty much agree with what you and Jennifer said. About 10 years ago, one patient like this would trickle in every now and then, and now I probably see two or three of these patients a week. It’s the same 10 or 15 clinics out there. Patients present having been told that they have four vessel reflux disease, and often times I spend 10 minutes just trying to undo what they’ve been told. The patient is convinced that they’ve got a leg problem and that these spider veins are the result of something on the inside. I have to do an ultrasound just to convince them that their veins are normal. To answer your question, I don’t know the best way to manage this. You want to just go after these offenders; however, there is no system to deal with this issue. If one were to blow the whistle on a fellow physician, this would likely result in protracted litigation. Who wants that? Tom: Mark Isaacs, do you go along with that or do you think something should be done formally? Mark Isaacs: I have faced this as well, and I think one point that should be mentioned is that sometimes the physician is well-meaning, but has been misled by an ultrasonographer who is inadequately trained to look at superficial disease. There is a group of surgeons in my area (I’ve often seen patients for second opinions); after seeing a number of these cases, I asked the patients how the ultrasound exam was done. They told me it was all done lying down. It’s possible that the ultrasonographer was overreading because of inadequate training and looking at superficial veins. That’s looking on the optimistic side. Obviously, there are the other surgeons or so-called specialists who do just overreach on these patients. I have to say that I have not taken a very aggressive approach with these other than with the patient themselves. I always show the patient the ultrasound as I’m doing it. It’s not that hard to understand. When the patient sees for himself or herself that there is no reflex, then it’s just a question of what to do regarding the first physician. I have on one occasion very gingerly approached the physician, stating that there seemed to be a big discrepancy in my findings and perhaps there is an issue with the ultrasound. I got an extremely defensive reaction that obviously was not going to lead anywhere. I think that I have relied mostly on the universe, I guess, to eventually reward those who do the right thing and to have a more negative impact on physicians who are financially motivated to overtreat. Tom: Mitch, in California, you guys are pretty tough up there. Would you let this situation rest or go to a regional or state medical society, if this is a repetitive problem? Mitchel Goldman: I agree with Mark and Jennifer and Jose. I’m not seeing this twice a week. I’m probably seeing inappropriate recommendations for intravascular RF or laser treatment every other week. Interestingly, I’m not just seeing it from the retired proctologist that then opens up a vein clinic, and is obviously (let’s call a spade a spade) trying to make money by doing this procedure. I’m seeing this a lot from invasive radiologists who are running huge clinics. I always like to give the physician the benefit of the doubt, although I know that probably is not correct. Like Dr. Isaacs, I do the duplex examination in front of the patient and teach the patient about it. Often times, in other clinics, the patient is with a technician and not with a physician. When it comes down to how I deal with inappropriate recommendations for surgical procedures, what I try to be as polite as possible, by sending a copy of my detailed note back to the physician. That puts a physician on alert that there is another person out there looking at them. However, sometimes the patient is so convinced that they still have the procedure done. I don’t know how many 2 millimeter competent great saphenous veins are being closed these days. Maybe it is for the best. Maybe it’s going to prevent venous disease. I don’t know that. It’s a very serious ethical problem, and I think that as Dr. Almeida was saying, to go to the medical society on this can get you in trouble as well. Tom: You are all right in many areas. This is an ethical violation, a conflict of interest, by not putting the patients’ welfare over that of making money. The experience of many of us in going to medical societies and state boards is that it can become a long and onerous process without much benefit. I wonder whether the certification of a vein center is going to do anything to decrease the problem. Steve Elias: I do think that the accreditation of vein centers will definitely help. Regarding the physicians that are doing this, the first thing is we need to make sure that the symptoms are due to vein disease, because many times we see patients who have had something done and their symptoms are really not due to venous disease but perhaps back issues, nerve issues or from joint issues, or whatever. Plus, when I see these cases beforehand and we do our study and we don’t have the same results as another doctor, I will call that person up the first and second time and have a personal discussion to say that we haven’t found this. Give them the benefit of the doubt and say maybe your technologist, as Mark alluded to, needs to start thinking about standing patients up. When it comes to the third time, I will then call the patient’s primary care physician—whether they were sent to that vein specialist or not—just to kind of put them on alert. From the beginning, I think that instead of just sending a report, actually talking to the guy or woman and saying, ‘I didn’t find what you found, and you know what? I’m not quite sure these symptoms are venous.’ They may take some offense, but in a nice way saying, ‘Gee, have you thought of something else?’ Most of the time, they are not as offended as you might expect them to be. Lastly, Jen and I have had this discussion: If you’re seeing 100 patients that come to you, what percentage of them do you wind up doing something on? We’re thinking 35%, maybe 40%. Some of the vein clinics, if they see 100 patients, they are doing something to 95 out of those 100 patients. I think that’s another problem. Their threshold of doing something is much lower than those of us who are on this panel. Tom: Have any of the medical directors of insurance companies called you and said, ‘We’ve got some problem people who keep doing cases. We don’t think the duplex scans are adequate?’ Before we went to certification of vein centers process, one major insurance company’s solution in Massachusetts was to limit endovenous thermal ablations to board-certified vascular surgeons or an interventional radiologists. Alternatively, another company required some type of qualification for your ultrasound tech. This was their method of trying to inject some quality into the process. Panelists, what are your opinions? Do you think the insurance industry can play a role in this, or they should keep out? Jose: Once third-party payers got into the system in the 30s, I think the whole dynamics started changing between doctor and patient, and now there is a middleman. Let’s just look at industry: you’ve got a vein center, you’ve got a fixed expense that you need to meet. Then these companies will come to you and say, ‘Listen, I’ll put a box in your office, but you’ve got to do 20 cases a month, at least 20 catheters a month and we won’t charge you for the box, but you’ve got to use the catheters.’ Already you’re getting locked into a volume that you need to meet to keep your generator. The insurance system is perverse. Because the office environment is unregulated, physicians with no formal surgical training can go to a weekend course and begin doing procedures in their office the following week. They can bill the same CPT codes that physicians with formal training use—and get reimbursed the same. This is absurd. One's level of experience and training should matter—instead, everyone gets paid the same. I think it’s just a whole system of misplaced incentives that’s feeding on itself, and now we’re seeing the unintended consequences. I’d take some of that off the physician and put it on the system because I’m not sure that it’s all with the docs. Maybe they are perpetuating it, but I don’t know if they have created it. Furthermore, why are insurance companies deciding medical necessity? This is not their place. Policies such as we'll pay for vein ablation but not phlebectomy just create more stupidity in the system. Tom: You need a fair review process in which the certification process may play a role. Do you think that we have hit the peak in inappropriate superficial vein procedures, particularly with increased scrutiny from insurers and decreasing reimbursement? Jose: I personally don’t. I think decreasing reimbursement is going to worsen the problem. Your fixed expenses are still there. Now, you’ve got to do more cases to offset the lower reimbursement. The IAC Vein Center Accreditation for oversight is good in spirit; however, IAC Vascular Lab accreditation has existed for 25 years—and still no link to reimbursement. I know in Miami, we have plenty of Mickey Mouse labs doing Mickey Mouse work that are getting reimbursed for sub-standard work. We often see reports from outside labs that state "no clot'; and this is their idea of a complete vein mapping study. There are inherently many problems that need to be dealt with, and I don’t know the best way to do this. Mitchel: I think it has reached a peak, and the reason is because the day of insurance companies reimbursing everyone for intravascular procedures is growing short. Their rates of remuneration are much lower than they were before. Now that it’s not as financially profitable, things probably are peaking out. Of course, people will figure out ways to abuse the system by measuring bubbles in the middle cerebral artery on every single patient that walks in and billing insurance companies for that. Excessive, unnecessary billings and procedures are going to continue to happen, and I think that we, as a society, have to address that and pressure our physicians to continue to uphold the standards of why they originally became physicians—to take care of patients and to do good. I’m not trying to defend the people who, of course, should be asking questions. I think it’s also this perpetual bad education, regardless of what their initial motivation was for entering these practices. The technique, as we all know, is straightforward. It’s the thinking and the indications behind it that are challenging and make the art of venous treatment so important and special. I think that’s also an element that needs to be addressed and rectified somehow. Again, I don’t think that’s going to be changed within IAC. Mark: I found that [insurance company medical directors] have gotten acquainted with me over the course of the years, and I’ve got a level of credibility that I might not otherwise have, so that when there is a person-to-person consultation regarding an unusual case, they are willing to give me the benefit of the doubt. Hopefully, the opposite happens when they are getting weird cases from doctors who are overdiagnosing and overtreating. That kind of one-to-one interaction I think can be helpful. I’m a little skeptical that arbitrary certification or the choice of one specialty over another or one type of training over another is going to improve the quality of care. Most, if not all, of the original work on vein ablation was done by non-surgeons, and yet traditionally in this country, we look to vascular surgeons as being the experts. My only point is to say that a traditional pattern of referral in this country for venous disease has been to vascular surgeons. Phlebology has embraced much wider backgrounds, and I don’t think that limiting the definition of expertise and specialty is going to solve the problem. I think that credibility is something that’s earned and not something that’s bestowed with a certain degree or a certain background. Jennifer: I wasn’t speaking to one physician being more apt or knowledgeable to venous disease. What I was saying is some practices in office-based settings are pressured to produce, and they are pressured to learn about venous disease very rapidly. They may just accept the algorithm by rote and just go ahead. That perpetuates the problem. Tom: Relative to that point, do you think that best practices or management guidelines can help solve some of the ethical considerations in the management of venous disease? Having these guidelines available certainly has solved some of the problems for the insurance companies in the Northeast. Jose: I think guidelines will clearly help—a good point of reference that people can have in front of them. I think guidelines are great. I think it’s important to note, you are not obligated to follow a guideline if your judgment leads you down another path. I think it’s a good thing in general. Tom: That’s very interesting. In preparation for this panel, I reviewed the various specialty societies to see if they really had any ethical guidelines. The American Dermatologic Society does, as do the Society for Vascular Surgery and the Society for Interventional Radiology. ACP has a committee on ethics, but I could not find any specific statements, and similarly for the AVF. Do you use the dermatologic society’s ethics guidelines as a beacon? Mitchel: Well, as a past president of both the American College of Phlebology and the American Society for Dermatologic Surgery, we did develop guidelines of ethical care. All of our members sign a form stating that they will abide by these guidelines. Now, obviously this doesn’t always occur, and the problem we have is in policing it. Hopefully, from programs like this and articles in journals like ours, we can remind doctors why they became doctors in the first place. I do have faith that most physicians, the vast majority of all of us, want to do what’s best for our patients. As long as we keep exposing those that don’t and ensuring that people will abide by the best standards and publish our guidelines of care, I think that’s all we can really do as leaders and colleagues in this field. Tom: Well stated. Now, one of the interesting things about your code of ethics is that if you’re a member and you observe another member acting unethically, as you imply, you are obliged by this code to report them. Mitchel: Well, that’s the code of conduct of the military armed forces as well. It really is something that should be done. Just like as physicians, if we see another impaired physician, it’s our obligation to report them, because it’s helping others, which is what we’re supposed to be doing. Steve: Mitch, I think you’re right in that we all need to remind other physicians why they became physicians. I don’t think most people who go to medical school say, ‘Hey, I want to become a doctor, and I’m going to milk the system and do things a little bit outside the line so I can make a lot of money.’ I think sometimes people lose their way. They lose their way for monetary reasons or whatever other reasons, including their egos. We need to remind them. I think the great majority of people who are not maybe doing “ethical things” have lost their way and they need to be reminded by leaders in the field. The second thing is we do need to create a culture like we have in our societies that you can teach members about doing things the way that they think is correct. You should in a constructive way try to help them if they are off the path a little bit, to come back, and if you need some help, we’re here to help. To immediately create an adversarial situation is probably not the best thing. The first thing is to give them the benefit of the doubt, try and bring them back into the fold, and try to remind them why they went into doing what they are doing. For the great majority of people, I think that’s going to work. There are going to be a few bad actors no matter what you do. I think if we give people the benefit of the doubt and remind them of what they bring to this field, perhaps we can turn things around a little bit. Tom: Many of you run venous meetings. How do you think the topic of ethics should be introduced? Do you think it should be part of an educational meeting? Jose: I do, and [IVC has] been addressing it for a while. We’ve got a session, venous governance-ethics, where we take these things head on. We’ve covered the issue in different forms over the years, but I kind of agree with Steve. If major meetings each had a session on inappropriate use, overutilization and proper guidelines, most physicians will do the right thing. Mark: I guess I tend to be a glass half empty sort of person. I’m a little skeptical, but I sure hope it’s true. Tom: Do you think industry has a role in requiring certain criteria for vein specialists, before they put a device or new technology in their hands, particularly as we are now seeing new techniques beyond thermal --the new non-thermal? What’s the ethical obligation of industry? Jose: I don’t know exactly how they should go about this, but clearly, I think there has been a disservice to patients and public safety by putting these devices in the hands of just anyone. When the podiatry community started doing this in Florida; that was just icing on the cake. We’re just waiting for the psychiatrists and veterinarians to get in. It’s a little over the top with Industry selling devices to anyone that will buy them irrespective of training. The corporatization of medicine is adding fuel to the fire. Industry should be held more accountable. Tom: Jennifer, what do you think should be the requirements to be qualified for a new technique? What should the physician go through to be qualified? A new non-thermal technique? Jennifer: I think it’s going to have to point to, I think, a multifactorial approach. Although industry is introducing a new technique/device, the primary responsibility is on us, the clinicians', to formulate an approach to teach our community. It's a difficult situation because we have varying degrees of experience. Further, there aren't any great models from which to design a teaching and accreditation type of process for individual practitioners. In all fairness, regardless of the specific interventional specialty, I think we’re still trying to hone in and help figure out how best to assess technical ability. I think this is just another example of that. Tom: Steve, you’ve had the experience with bringing a new technique to us. What do you think should be the process of ethical adoption? What’s the flowchart, if you will? Steve: There needs to be some baseline of experience. I think you divide people into experienced people who have used other technologies to deal with venous disease and people who are not experienced. For the inexperienced people, industry, for the good of the patient and for their own good, needs to make sure that these physicians see a few cases and are proctored in some way for their first couple of cases. Then you need to have a revisit after doing a certain number of cases by someone that the company feels qualified to judge how they are doing. If you don’t give that follow up after someone’s done some cases, they may get into bad habits and keep doing what they are doing incorrectly with poor results. Experienced people also need training but it needn't be as rigorous. That impacts the patients of course, but it also impacts the company. It’s in their best interest to have everyone doing as good a job and be as well-trained as the person who has the most experience doing those procedures. I think most companies, as they get bigger and bring something to market, do now have something in place that sets minimum standards that physicians have got to go through—whether it’s an online training, seeing some live cases or having a physician proctor or clinical specialist there for their first number of cases. Because in the end, you don’t want other people out there saying, ‘Hey, I’m not getting good results as so and so is. This procedure really stinks.’ It may be that the procedure really isn’t working in the hands of the general public, but it may also be that that person needs some further remedial training. Adequate training is something that is going to cut through the lines of all new technology. You don’t just give it to someone, even if he or she does have experience with another technology. I don’t want someone to just give me a new device. In a lot of these cases I’ve got someone else looking over my shoulder saying, ‘Yes, here are the two or three key points when you’re doing this versus what you didn’t do.’ And I have a lot of experience with a lot of technologies. I’ve said to companies and I think many of us have said this, the companies are getting it. They need to institute some formal training with the need for that physician in mind. New physician gets more intense training. A physician who is already doing a similar type of procedure may not need as much training but they need to clearly discuss it— what are the nuances of this new technology? They still need to be watched and still need to get feedback from a physician or a clinical specialist. I really believe they need to be revisited after they’ve done a certain level of cases to make sure they haven’t developed any bad habits. Most companies nowadays don’t just throw something into the market. They do require some type of formalized training or observation before they put the device in the hands of people. Tom: One example is BTG and their FDA application for Varisolve. They required a formal instructional process to use their product. I think the FDA is stepping in now, realizing this problem with appropriate education. Jose, you are involved with this process a lot. Jose: It’s an excellent point of discussion, and when one thinks about the endovascular revolution one can see how disruptive it’s been. Traditionally, surgeons did venous procedures in the operating room with general anesthesia. The surgical lines were clear. Endovascular procedures have blurred the surgical line. Now, multiple specialties are involved because minimally invasive devices are easier to use. Physicians can circumvent formal training and do things in their office with no oversight. This must change. Certainly, the superficial vein work, one could take issue that non-formally trained people are doing this. However, when working above the muscular fascia, there are many non-formally trained people doing a nice job with vein ablation work and varicose veins and some vascular surgeons doing a bad job. When we start going into the deep fascia with deep procedures, I really think formal training should be a requirement here. I worry about the next phase of office-based surgery with the self-proclaimed interventional phlebologist now doing deep vein surgery. Certainly, we’ve seen that with interventional nephrology. It goes back to your question of guidelines. I think societies need to get more involved with guidelines, defining superficial vein space, who should be doing this and the training, and how one gets trained when new technologies come in, because we’re certainly not going to go back and do a new residency. Then separate the superficial and deep space as two different things requiring two different levels of training. We need to realize that training is important, and we need to institute some way of people being trained formally in new techniques so they get themselves up to the skill level they need to be as quickly as possible, but realize that there is nothing wrong with having someone help you or getting help or being observed for the first X number of cases. We made it seem like, ‘Hey, no problem. Read about this. Take a weekend course and you too can treat vein disease.’ That’s not the deal for sure, from a procedure viewpoint and from a cognitive viewpoint of having managed venous disease. We may not be having to talk so much about ethics going forward if we take the step backwards and say, let’s train people correctly wherever they come from so that then said, they don’t get into this culture of doing things the wrong way because they are being trained by someone who is doing it for the wrong reasons. They need to stop it. Industry has a big role in that and we as society, the people running courses, need to do that too. Tom: What you’re saying is that both good training and following guidelines may trump unethical practice? Steve: Right. I think so. We’re always going to have bad actors, but I think the percentage will be much, much smaller because most people are not doing this to screw the system and get the most out of it. They are doing it for gains, for maybe lack of knowledge, lack of training and thinking that they are doing the right thing, but they need to be trained better and maybe we won’t have to worry as much about the ethical issues because as Jose has said, it kind of went out of the box once the endovenous revolution came about and everybody started jumping in. Tom: It’s been such a significant revolution, just like the arterial side. It’s been incredible. If you had two or three words, how would you typify unethical vein care? Mark: Well, I think when the decisions being made are clearly financially driven as opposed to the welfare of the patient, that’s what differentiates just poor care versus unethical care. There are doctors who make poor decisions for one reason or another—either by virtue or poor training, or just poor thinking. I wouldn’t call them unethical, just lousy doctors. When someone who has the smarts to know better is making decisions based on financial gain, that’s clearly unethical. Tom: I think that’s a very good functional definition. Again, it is not placing the value and welfare of a patient above all else. Unethical is probably overused as most frequently diagnostic tests and procedures are generally done to generate money. Jose: It’s self-interest above the patient’s interest is what it boils down to. The ignorance, poor education just defines a lousy doctor. It doesn’t mean they did it intentionally, but if you’re not educating yourself and keeping up, that’s unethical also. At the end of the day, I really think societies should be taking a different role because that’s the doctor’s forum. We don’t need insurances to be regulating us or the government. We need to do this ourselves. After one finishes their training, the societies are all we have, this is the forum one can go to throughout the rest of their career. I think societies need to be taking on these things-- such as inappropriate use--as we’ve stated. I think it would be helpful just knowing that your peers are looking at you. I’m not sure societies need to play a punitive role, but I think most cats will line up if given the proper information. The bad apples are always going to be there. That’s just part of the human existence. You can’t do anything about them. They are lost. Jennifer: I absolutely agree. Not being knowledgeable certainly doesn’t have meaning if someone is unethical. I agree with Jose certainly that the onus is upon the physician and I think that that’s an excellent point that our society (not government) should take a more regulatory role and try to figure out means to further education and also to further standards, and make sure that those standards are adhered to. Tom: We probably should put that in the front of the summary of this roundtable discussion rather than at the end, because it provides principles to live by.